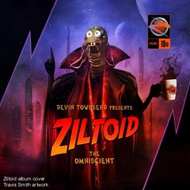 "Ziltoid the Omniscient", Devin Towsend's first "pure solo album" is supposed to be it for a while for the enigmatic and creatively brilliant main man for STRAPPING YOUNG LAD and THE DEVIN TOWNSEND BAND. And what a fantastic way to end this chapter of a career marked by sheer genius. 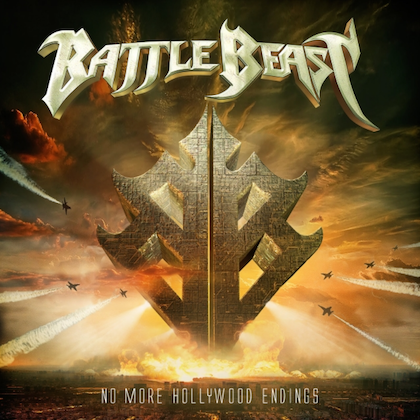 "Solo" is to be taken in its most literal sense here, as Townsend created the album entirely on his own, borrowing the "Drumkit from Hell" software from MESHUGGAH's Fredrik Thorendal and programming the drums (and a grand job he did with it). "Ziltoid the Omniscient" is a cosmic metal opera with hilarious narration from this peculiar Ziltoid character, bombastic musicality, and one hell of a lot of tunefulness. First things first, the story, in Townsend's own words is as follows: "Ziltoid is a fourth-dimensional alien from Planet Ziltoidia 9, far across the Omniverse. On his home planet Ziltoid is considered a nerd, but he has discovered that the third-dimensional creatures like humans can have their realities manipulated by fourth-dimensional entities such as Ziltoid through their control of time." Got that much? Now get ready for the clincher. Ziltoid has traveled to earth "in order to procure all the black coffee he can in order to travel back through time and present himself as the ultimate fourth-dimensional rock star." Now tell me, who in the hell could write such an endearingly zany story and turn it into an all encompassing explosion of metallic madness other than Townsend? The guy is out of his mind and we should all be thankful for it. The album is 100 percent Devin Townsend in the way that it captures a little bit of everything that the man has created in his career: the cyber metal bursts, the spacey atmospheres, and those distinctively dreamy and utterly captivating melodies for which he has always been known. The narration by Ziltoid himself and a cast of characters that includes Captain Spectacular who is out to expose the true nerd that he knows Ziltoid to be, is entertaining as hell. Trust me, you will not be able to stop smiling, or outright laughing for that matter. Not as forcefully heavy as STRAPPING YOUNG LAD, but still pretty darn heavy, and filled with significant chunks of those wonderful DEVIN TOWNSEND BAND melodies, the album still stands as a work like nothing else he's ever done. Though the disc works best as a one-sitting science fiction experience, as simply listening to individual tracks does not drive the point home, a song like "Hyperdrive" is particularly noteworthy for its quintessential Townsend melody. With a concept and artwork that would make Tim Burton proud (just look at the Mars Attacks features of the Ziltoid character on the cover) and a stunning musical delivery, "Ziltoid the Omniscient" is an album that is sure end up one of the year's best. There is nothing like it out there today. But then, what would you expect from the mad scientist that is Devin Townsend?